This 'Image' tab allows the user to set the Capture hotkey, Repeat screen capture and Format. Hotkey: The 'Hotkey (F11)' option enables the users to designate the hotkey for image capturing. Repeat screen capture: The 'Repeat screen capture' option enables the user to repeat the capturing at a certain interval. When the 'Repeat screen capture' option is selected and the hotkey is pushed, repetitive capturing will be initiated, while pushing the shortcut key once more will end the capturing. Show mouse cursor: If this option is checked, the mouse cursor will be shown in the image capture. Enable shutter sound: The shutter sound will be played when an image is captured. Format: The 'Format' option allows the user to decide the format (BMP, PNG, and JPG) of the image that will be stored. 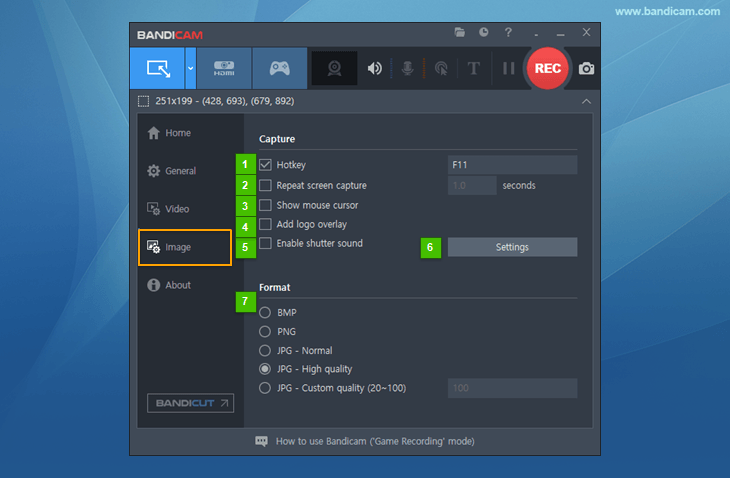 How to save as animated gif: Try Honeycam to make animated GIF/WebP/WebM image files. Please press the image capture hotkey (F11) or click the 'Camera' icon on the rectangle window. You can take a screenshot after drawing lines, arrows, boxes, text and numbers. This Logo tab allows the user to add the logo to the image that will be captured. Add logo to image: This option allows the user to add a certain logo to the image that is captured.